Those who want a close-up picture should go to the first-hand accounts of life in New Orleans at the Metblogs site there if you want a true sense of life under the threat, and now in the aftermath, of Gustav. New Orleans is close to Austin, with a place in the hearts of many. I’ve been reading these true-life tales since Katrina days and didn’t think to tout New Orleans Metblogs as the storm approached. But the story continues. I guessed somehow my interest in my new Austin home town would eventually spill over into my professional life. It happended though in a way I couldn’t have predicted. One of the people I follow on twitter is IT Industry Robin Bloor. Bloor is also an ex-pat living here in Texas, we only met a few times back in the 90’s. He is currently a Partner with Hurwitz and Associates in the US and also maintains contacts with Bloor Research, the analyst company he founded and established in the UK. Yesterday Robin posted 10 Green Questions on his Have Mac will blog, blog. My first reaction was this as another green IT blog, but wait the first question was about plastic bags! Oh ok, its broader than just IT… but then I chuckled my way therough the remaining entry, which included Question 8. of interest here since I know fellow Austin metblog Author @lauratex regularly works from various coffee shops around the ‘hood on her bicycle, and I work from home from time to time, and by coincidence my drive to the office is 12-miles and I do bike it from time to time. Here is Question 8 and Robins analysis, enjoy the rest here. Question 8: Is it greener to work from home? Answer: On the plus side you wont be commuting. The average work journey in the US is 12 miles, and each gallon of gas burned emits 25.3 pounds of carbon dioxide (CO2). Imagine you don’t own a gas guzzler but a 25 mpg car. In which case you’re spewing about 25 pounds of CO2 into the air per day (6000 lbs per year) melting glaciers, raising the sea level and killing polar bears. However, if you stay home you’ll be using more air conditioning or heating, the extent of which could easily total as much. Don’t work from home, get a bicycle and work from Starbucks. The Metblogs network has added a new…um….country? Say hello to The People’s Republic of Unterzoegersdorf . Ambassador Nikita Chrusov, who made an appearance at eTech last week, is appearing at the Plutopia EFF party at Scholz’s as I post this. I hope that diplomacy will prevail. 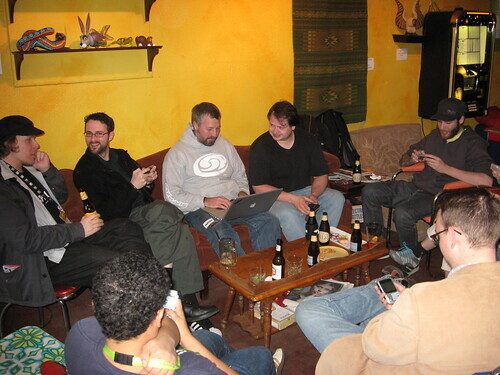 We had a SXSW meetup of Metbloggers from Minneapolis, Los Angeles, San Francisco and Austin today at Rio Rita. The main topic of conversation was the trainwreck Mark Zuckerberg interview that had just taken place. In fact, a website to commemorate the occasion was conceived and implemented during the meetup. I just took pictures. Don’t forget about the Metblog meetup in 30 minutes at Rio Rita. It’s at 1308 East Sixth near Attayac (that’s 4 blocks east of I-35). I’m Richard Ault, from San Francisco and the SF Metblog. I’m in town with Sean Bonner and Jason Defillippo, collectively the guys responsible for Metblogs. I’ll be guest posting bits of my experience here in Austin over the next couple of days. To get a sense of what I’m interested in, you can check out my previous posts, or my photoblog. We’ll all be at the Austin Metblogs Meetup tomorrow also, looking forward to meeting the community who read and write this blog!